How did Christmas sneak up on me? It is on Sunday and we’ve barely finished Thanksgiving. Christmas has definitely changed over the decades – yikes, it is literally decades at this point. Growing up, Christmas was like the rest of the year – family time. My Dad once told me if they could take the three of us, they didn’t want to go. I don’t remember Christmas the 1st 7 years of my life in Southern California – my memories are of 1955 when we moved to this house in Seattle. We usually bought a Christmas tree a week before Christmas, but it went into a bucket of water at the bottom of the outside basement stairs. There was a store called Chubby and Tubby that had 99 cent trees. We would all split up and look for a tree in the lot – then we had to decide which would be our tree. I usually saw a cool tree – being held by someone else. I loved the smell of Douglas fir – that is the smell of Christmas to me. Christmas Eve was when we decorated the house with greens and put up the terrace. We had a holly tree next to the house and a cedar type hedge by the drive and usually a fir somewhere by the canyon. As the Christmas cards arrived in the mail, my Mom hung a ribbon or two to the front door and taped up the cards. She had hooked a NOEL hanging for the front door, so sometimes that went up first and the cards were on ribbons on either side of the fireplace. During this time, Mom would be making Christmas cookies and we “helped”. It was mainly decorating, though whatever we did, it was fun to be in the kitchen with all those wonderful smells. And Christmas fudge – a recipe Dad got from someone at North American. He was told it is the See’s fudge recipe – whether it is or not, it’s wonderful!! I remember Mom putting it in the hall closet to cool off. We would also go out to the see the Christmas Ship – yacht decorated with lights and a different choir every night singing carols. There were small boats following it, also decorated with lights. They would stop at different places w here a bonfire was built and they would anchor in as close as they could and play carols to all of us on shore. There was a schedule published for the week or so they did it, on the lake and the Sound. Afterwards, we would be cold, so we came home for hot chocolate and Christmas cookies. The day before Christmas we decorated the house. The tree went up and after Dad tied it to the curtain rod to keep it from falling. He put on the lights while the rest of us decorated its. We never had a “coordinated tree”, the decorations were from different times. There were some from when Mom and a Dad were first married, some came from friends or we made; others were bought to supplement those that broke – it was a hodge podge – our own special hodge podge. We had to keep filling the pan for the tree with water because the cats kept drinking it. We were fortunate it didn’t occur to any of them to climb the tree. One year we put up the tree a week before Christmas – we all were tired of it before Christmas arrived. By doing it Christmas Eve, then the next morning was Christmas. Mom made a sour cream coffee cake for breakfast and then we opened our gifts. Then Mom made a proper breakfast. When my older sister was married, Mom decided to have Christmas Eve, then they would spend Christmas with his family. when I was married, I went out of the country. Our first Christmas as a married couple was in Australia – it didn’t feel like Christmas because its was in the middle of summer. We had a rather sad artificial tree with some ornaments. What I do remember is one of the women at the store where I worked asked me the significance of a white Christmas. That brought me up short until I realized all the Christmas cards, movies, etc. show snow – how could they connect in the middle of summer? The worst day was Thanksgiving – no one there knew what it was or why we celebrate it. I made the mistake of thinking what Mom and Dad would be doing and it really upset me. I couldn’t really explain why I felt that way to the other women. When I came home from work, Eddie had cooked a whole chicken for us. When we came back from Australia, we were living in San Francisco and no money to go to Seattle for Christmas. So Mom and Dad and my younger sister came to us for Christmas. After that, Eddie was able to arrange business trips to Seattle, we just had to pay for my ticket. So for many years we went to Seattle for Christmas and my sisters would come too. One year our godson from Australia came for a 6 week visit – 2 weeks in LA where we lived, 2 weeks in Seattle for Christmas and 2 weeks in LA before we left for home. it was an interesting time, I took pictures, bought postcards and assembled a photo album so he could show his family. It took some time to do the album, so it was after he left that it was done. When he came up here, we had a small fir tree by the drive that was big enough for a Christmas tree. He and Dad cut it down and put it up in the living room. We also went to dinner at Ivar’s salmon house by the locks and the Christmas ship was going through. We had a lose up view and heard the carols. When our 2nd oldest niece came t3o visit, she w as amazed because it wasn’t like Jerusalem at all. My parents took her on a walk down to the beach on an old logging road – she said she had never been in a forrest before. SHE saw Vashon from our window and wanted to see an island – not sure what she expected. I was surprised to find there aren’t Christmas trees and decorations in Jerusalem. When she was here, we started new tradition – a middle eastern buffet for Christmas Eve dinner. My sisters were still coming for Christmas and we continued it for several years. It was getting harder to travel during Christmas and my sisters haven’t been here for quite a while. Both Eddie and I were glad not to travel this year to Toronto – we love being with them but the getting there and coming home is not always easy. Lately Christmas has been quiet – my Mom and dementia and for 2 years we went to Toronto to our oldest niece and her family. This year is just us and for Christmas dinner, we have invited a good friend. Although things are different, there are always reminders, big and small, of all the Christmases in my life. Wishing everyone a lovely Merry Christmas!!!!!!!! Things started slowly this week and ended up more eventful than I expected. Monday I only went out around Burien to do a couple of things – I like the choice of going out or staying home a lot more than stuck at home. I also need to walk more to reduce inertia and liturgy as well as slowly build energy. Monday was a very quiet day. Tuesday I decided it was time to go on 518 where the accident happened. I went down to Southcenter going east on 518, walked through several stores and just enjoyed being out on my own again. Then I needed to go home and although I wasn’t nervous or shaky about going back the way where I was hit, I asked God to give me everything I needed and I would just show up and get out of the way. So I don’t think I was uptight to stressed, mostly I wanted to do it and get it done – back on the horse, so to speak. Everything went well and I was fine, though looked in the mirror a lot to be sure about traffic behind me as well as in front of me. I arrived home safely and relieved to have jumped over a small hurdle. Wednesday ended up being one of those busy days. I went to Breakfast Club for the first time since the accident – they were pleased to see me and I was happy to be there. It only felt a tiny bit odd after 3 months, but I figure it will be familiar again by next week. Our numbers are a bit sparse lately, not sure if people are busy with business or something else. I know one is out for surgery and chemo for a while, a new member has been home because his wife had surgery. I haven’t met him yet. Afterwards I went to south center again, picked up a couple of things on sale I had seen the day before. I checked out a couple of other places and then it was time to go home. My feet and legs were shouting at me and I paid attention. Eddie and I were meeting back here at 1 because it was doctor afternoon. First stop was the dermatologist – I have been putting off having a couple of spots on my face seen to – way too long. I remember the last time I had biopsy done in earlier years and it was a very unpleasant experience I didn’t want to repeat. But Eddie and my rheumatologist decided it was time. So I had a full body exam and she found 3 places she wanted to biopsy – the 2 on my face and one on the back of calf I had no idea about because I couldn’t see it. Eddie decided he didn’t want to be in the room while they were done – no big surprise. It was a good thing because I really came apart jut having the anesthetic injected – crying and upset. I’m not usually like that, though I will protest when it hurts, I think something else emotional was going on as well. So she took the biopsy and the one on my calf needed stitches. I will have to admit I didn’t feel the actual biopsy, but I was so glad it was over. She also froze several spots on my face and arm. I looked as if I had been in bar fight. I was given instructions on how to care for them and I will see her in 2 weeks to remove the stitches and find out the results of the biopsy. Then we went to see my rheumatologist – she wasn’t there but I saw Jennifer, she was Dr. Sheets nurse so I am glad to see her every once in a while. Then to Infusion for my Orencia. It was also the evening of the Museum of Flight Volunteer dinner that started at 6. We finished everything about 5, definitely traffic time. If we had gone, we would have been late. However, I just wanted to put on my jammies and crawl into bed. Eddie has been dealing with cold or flu, we really don’t know what it is but he is feeling ratty. He didn’t want to give it to the people at the dinner, we opted to go home, have a light dinner and relax. Whatever he has, I want no part of it, so I have been taking Vitamin C and my Chinese herb capsules. So far so good. Thursday evening we cleared things out and found Mom’s bed – we put clean sheets on it so Eddie could sleep there and not give me his stuff. Does seem strange to be alone in bed, I have bunny to keep me company. although I am tired at night, I haven’t been sleeping very well, not sure what is going on. Friday was the end of Eddie’s first week working at Andy’s. He has found there is not really any organization – just the kind of challenge he likes. He has been enjoying himself, thought the “stuff” has made him uncomfortable and he felt so ratty that he was home early. We were both tired and decided soup was a great idea. A cup of tea in the evening really hit the spot for both of us. Saturday we just went to PFI for cheese, olives, and halva; then over to Uwajamaya for fruits and veg. It was a cold, raw day, so we did our errands quickly and came home. I took a nap and Eddie did the laundry – then I folded it when I got up. Today is cold and wet, we have been inside all day – should help Eddie get over the “stuff”. As for me, so far, so good. Which reminds me, I need to have my capsules and Vitamin C now. Today, October 8th, 2014 was a Wednesday and as I was about to start getting ready for Breakfast Club, the phone rang. It was Judy from the adult family home where Mom was living – she called to tell us Mom had died in her sleep about 4:50 a.m. I realized that was less than half an hour ago. It upset me but also it was relief for all of us, especially for Mom. She didn’t want to be here as the dementia began its course and she often asked why she couldn’t just go. Sometimes I think she was afraid, not sure whether it was true Dad was waiting for her. A relief for her that she was no longer afraid, confused and stressed. Even though she was at the point where she slept a lot and didn’t necessarily know who I was, it was a sad and happy time. I went to Breakfast Club that morning because I didn’t want to be alone – my friends there were so caring and loving when I told them. When I was planning the Celebration of Life, I asked my friend Julia to help with a post card to send or hand out to people inviting them. She did such a lovely card. The pictures on the left were taken in 1937 – I think it was about the time she was at Pratt Institute. The larger one is of her when she went to dance. The picture on the right was taken in 2008 when my sister Candy had a book signing here in Seattle. The background is supposed to be lavender, one of Mom’s favorite colors. I liked the touches of pink because she loved pink as well. I decided to have a bit of green because she had a wonderful way with plants – wish I had inherited her green thumb. 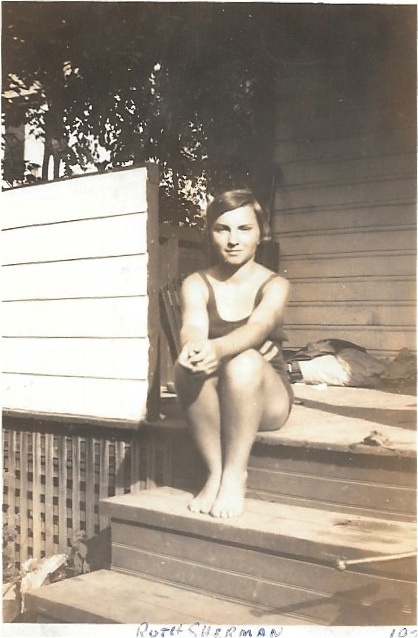 As I looked at the pictures for the postcard, I thought about as her younger self and found some pictures that make me think of her especially. 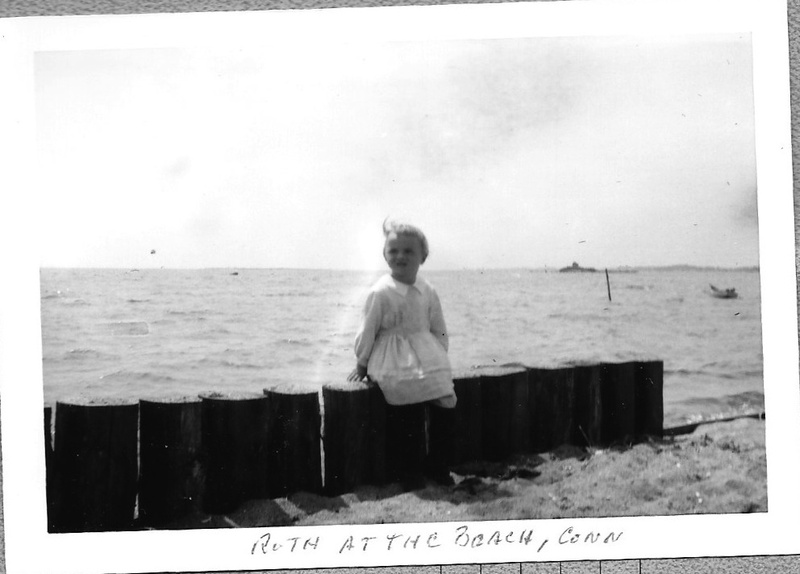 Every summer for several years her Dad would rent a house at Clinton, Conn – right on Long Island Sound. Many of the other family members also rented houses there. 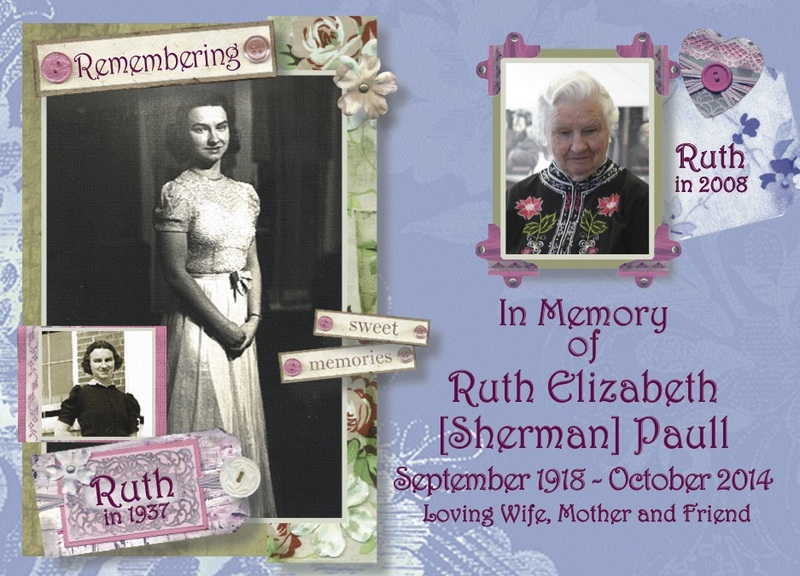 I remember as we were growing up hearing stories of her childhood and her relatives – The seven Smith sisters and their young brother Charlie. They put the “fun” in dysfunctional. Her brother Don used to drive them to places and he needed a scorecard token track of who wasn’t speaking to home, who was talking to whom. He used to tell stories about them – I began to call them the Awesome Seven. There was Aunt Bertha, Katie, Victoria, Amelia and Tillie – I can’t remember the other 2.Aunt Amelia and Aunt Tillie were the most interesting. Aunt Amelia worn long, baggy and drab sweater and dress from the missionary box. Don said he always thought the uncles’ first names were Poor. Aunt Amelia was married to Poor Allie – Allen – who worked as a night watchmen at Brown Thompson, a well know department store. He dies before her and she lived a few years after. When she died, the family went to clean out the house and found a lot of Brown Thompson boxes filled with lovely new clothes – with price tags. Now no one is sure if Poor Allie “liberated them from the store or just what the story was; but Aunt Amelia never wore the clothes. Aunt Tillie was the pot stirrer, so the family was glad when she and Poor George moved to Meriden. Poor George worked for International Silver and on summer evening he was a night watchmen in the park. It gave him a great opportunity to enjoy looking at the ladies. I suspect Aunt Till was not the easiest person to live with, she was a bit peculiar. When Poor George died, she moved back to Glastonbury near the family and stirred the pot most of the time. She had Poor George buried in Glastonbury and she arranged for a bench to be put by his grave. Every day she would go down to his grave and cry. She was living on the second floor of a two family hose, when she died she wanted to be put in her coffin there and then brought down. Mom’s brothers had to hoist the coffin up the outside and into the window. While they were having a service there, Uncle Howard jack knifed in the chair – took a while to rescue him. Then they decided to take the coffin down the stairs – unfortunately Mom’s brothers had a problem and Tillie went down the stairs end over end. We grew up hearing about the aunts, mostly Aunt Marion, Aunt Dot and Aunt Marge. They were her father’s sisters, though Aunt Marge was an aunt by marriage. But I always think of them as a trio. 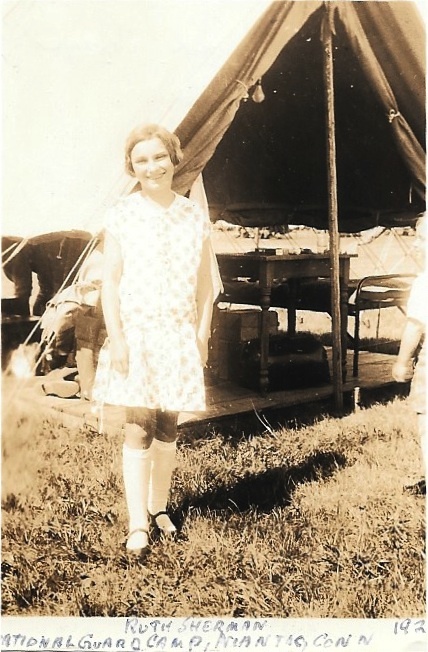 When Mom’s parents went away, the kids stayed with Aunt Dot and Uncle Howard; they had no children and they enjoyed looking after Mom and her brothers, later her much younger sister. Aunt Marion was the only one who supported Mom when she went out to California right after Pearl Harbor to marry Dad. 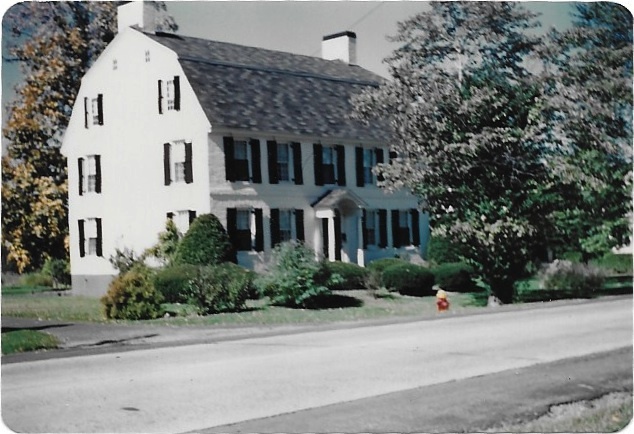 I think this was taken at “The Farm”, the house Grandfather bought in Waterford on the Connecticut River. I know this was taken on the river in Waterford. Mom came from a big family, with grandparents, aunts, uncles, cousins, etc. in town. I have always wondered what it was like to grown up that way, though it was lonely for Mom for quite a while. 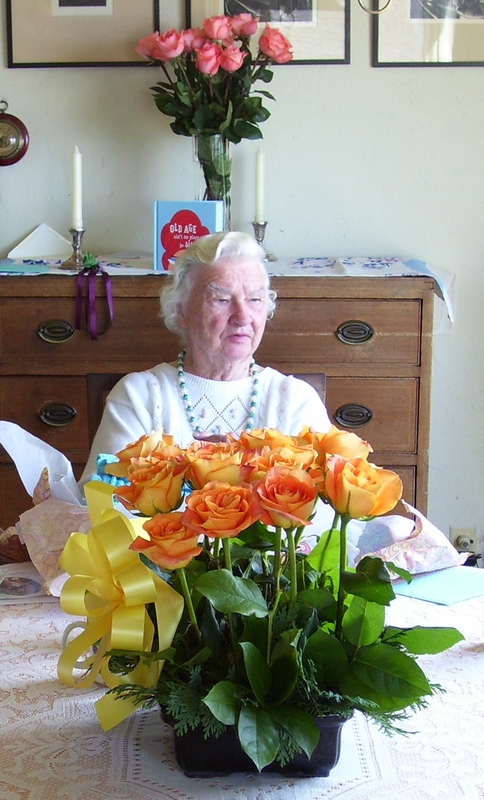 During the war she made a trip up to Glastonbury to show her family Ellen – the first grand child. Around 1964 or 65 she went back for her Dad’s funeral – she was a little embraced to say she had a wonderful time. 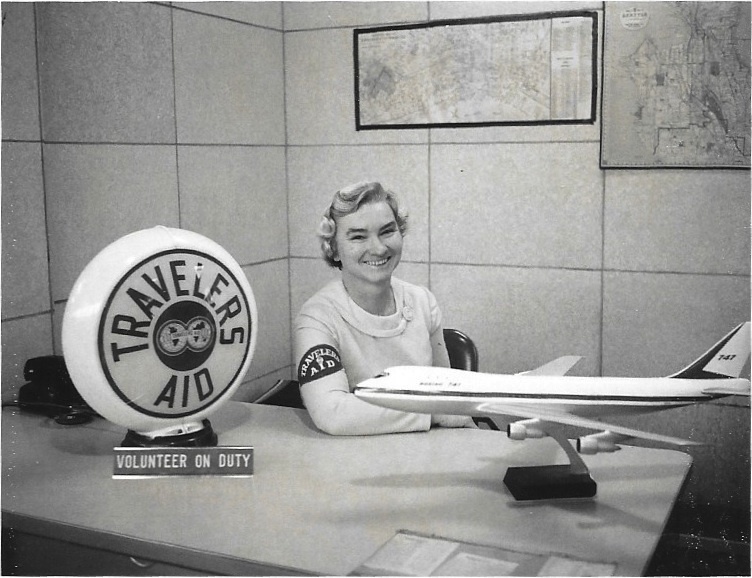 When she came home, she started rug hooking and volunteering for Traveler’s Aid at the airport. In 1970 Mom and Dad started a custom wood business for sailboats – Dad had been told he wouldn’t have a job in 1971 and he retired to the business. By then, all of us girls had left home, so they were too busy to experience the empty nest syndrome. This was the small desk in the airport when she started. What a change from then to now. They ran the business until 2000 together and when Dad died, Mom continued to run the business for 4 or 5 years. She was in her 80’s by that time and she decided she didn’t want to be a captain of industry any more. She continued to volunteer at Traveller’s Aid until it was decided to discontinue it – some bright spark at the Port had some ideas of her own and wanted to build her own empire. So Traveller’s Aid was thrown out. Really bugged Mom, but she started volunteering at the Senior Center Thrift shop. She enjoyed it a lot and really liked the women there. There was a burst pipe and rather than fix it, the city decided to close the shop. Seems someone had their eye on the property. These ladies were not about to be kept down; they decided to come here on Mondays to play Mexican Dominos together. Mom really enjoyed having them here and they didn’t lose touch. They stopped coming shortly before Mom moved to the adult family home. 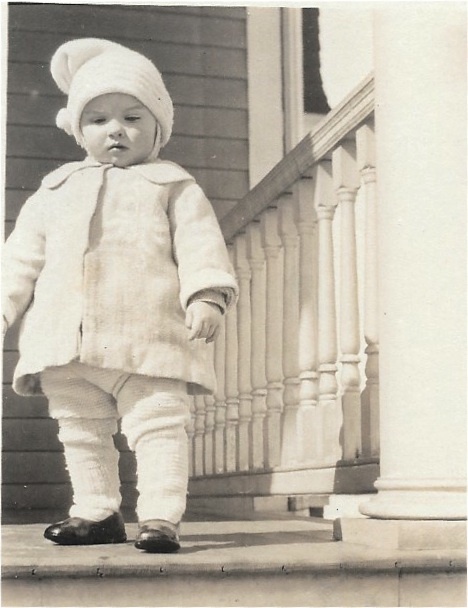 Mom was a member of the 1918 Club for quite a few years. Unfortunately they began to pass away and Mabel in particular was a great friend. I think Mom missed her a lot after Mabel died. All this time Mom was rug hooking, making friends and began to teach rug hooking here. After a while, she told she really didn’t want to teach, she just wanted someone to play with. So they came every Thursday – they needed to come here and Mom needed them to be here. It was difficult for her to give up hooking, but her hands and neck were bothering and she couldn’t see any more because of macular degeneration. 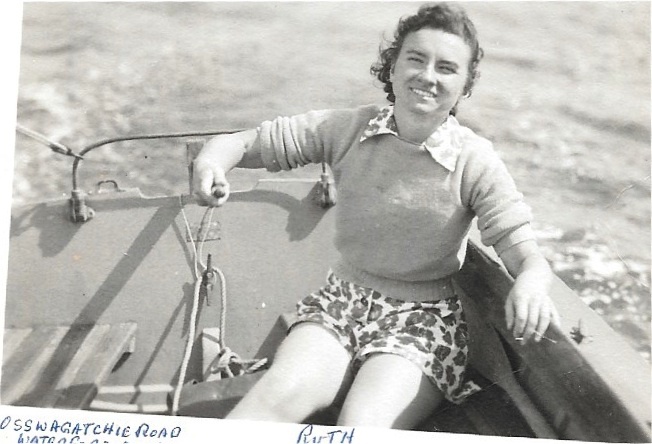 I think that robbed her of a lot of thins she loved to do – hooking, reading, gardening – she wasn’t unhappy to give up driving because she always hated to drive. Dad tells the story that in 1942 or 1943 she had to learn to drive very quickly. Her brother Don helped her buy a car in Connecticut and drove with her to , I think, New Bern, NC. Dad was going out of town on business and she would be left with Ellen by herself. I think Dad taught her to drive and when they went down to the Motor Vehicle Department, the guy asked Dad if she could drive. He of course said yes and the guy told Mom “Lady, if your husband thinks you can drive – here’s your license”. When Dad had to leave, they drove to the train station, he left and Mom had to drive home with baby Ellen. Unfortunately she got stuck in the middle of a parade – not conducive to feeling comfortable driving. This has become a lot longer than I planned – I will give it a rest and will probably do another installment. I’ll see what other pictures I can find – I finally have mastered the fax machine. In some ways it seems a long time, other times it only happened a little while ago. A lot of things have happened since my Mom died last year on October 8th, 2014. I scattered Mom and Dad’s ashes on January 16th, 2015 into the Sound from a ferry – she wanted her ashes combined with Dad’s and I was able to do that for her. 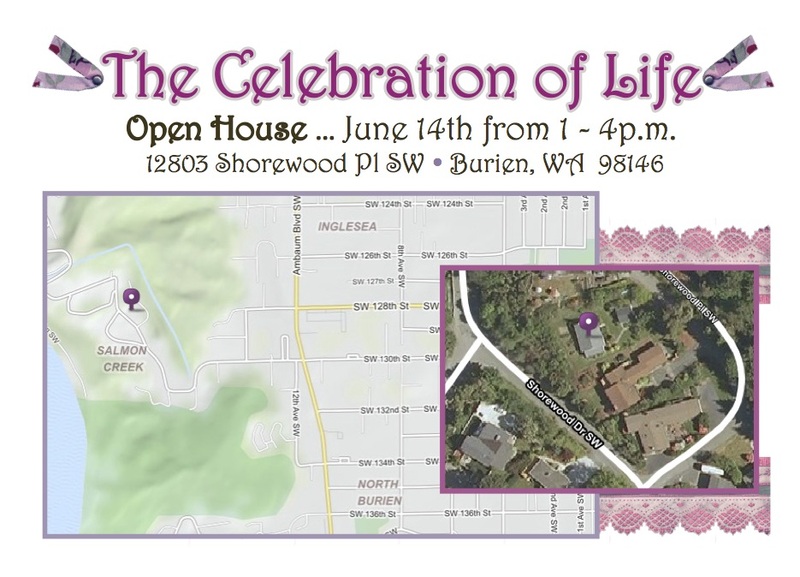 In June I did a Celebration of Life Open House for her and was pleased to see so many people there who knew Mom and Dad, plus special friends of ours. It was the last thing I did for her, except to remember her and all she gave me and my sisters as our Mom. I know she was definitely ready to go on the next journey, she missed Dad and Josephine the cat so much. 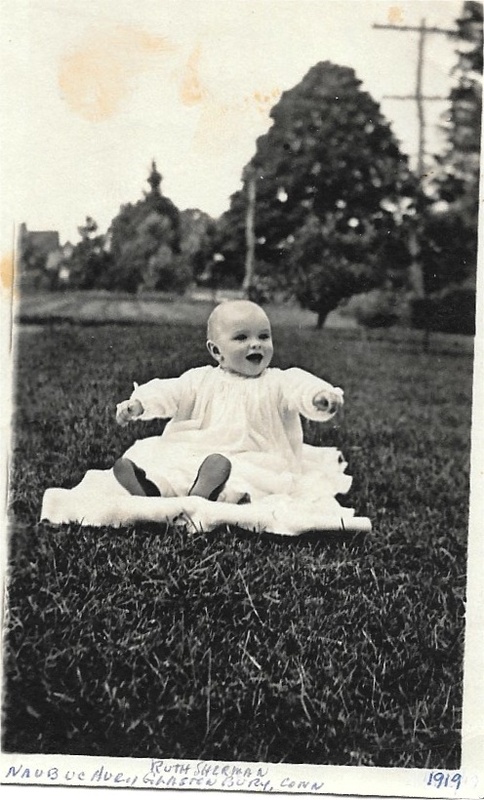 I had talked to people who communicate with spirits and they told me Dad and Josephine were waiting for her, there would be a big party to welcome her. The animal communicator told me Josephine loved them both – she was definitely their cat. She also said Josephine was waiting for Mom so she can sit in her lap – how true that was in life. Some would say it is just woo woo, hocus pocus, goofball, airy fairy nonsense; I don’t agree. An intuitive told me that Mom kept us at arm’s length because she thought that was how she was supposed to do it – in some things, that explained a lot for me. I was upset about seeing her descend slowly into dementia, it was difficult to deal with her and it hurt to lose my Mom and wonder who this woman was who took her place. I finally realized Mom was teaching me and giving me gifts in the process – it has taken awhile because I was in the middle of all of it. I took a 6 week grief support class and that helped, I find myself getting teary eyed as I write this – I am not sure where I am in my grief or what works for me. I know there were many times I wanted to run away and not have to deal with all the changes and what was happening to her. But there wasn’t anyone else to help, just Eddie and I. People told me I would regret not being there for her and I now realize they were right. There were times when I didn’t want to visit her twice a week, but I didn’t want her to ever think she had been abandoned, so I went. I mostly read to her towards the end; mostly I put her to sleep. I brought chocolate each time until she was at a point she couldn’t eat it. Eddie and I cleaned the house – still a lot of things left – and made sure the furniture went to good homes. We painted the living room and then brought up our furniture to make it finally our home. We still have a lot of work to do, but the living room and kitchen makeovers have made an amazing difference. I wanted it to be done for the Celebration of Life and it was. Then as I was resting from all of that and getting ready to continue cleaning out, I was rear ended, my car was totaled and my arm was broken in 2 places. The surgeon has said the humerus is healed after 8 weeks, just be careful and do the exercises he gave me. I need to be able to drive to have the focused physical therapy to help get me back to as close to normal as possible. The past 5 years have really helped me grow and mature – I have the confidence I can handle whatever situation comes up, I have a support team and people I can count on for help and information. I thought I had to do it all myself, it scared me because I had no idea what to do in any given situation. I’ve felt like a scared little kid for most of my life, it made me feel powerless and helpless. Now I know I am an adult and I know I can handle it, and/or ask for help. It’s so lovely not to have the sling on, restricting my movements. I am slowly feeling a little more my regular self each day, though stretching my muscles to be able to drive again is not a comfortable activity. I have simple exercises to do, some are not all that easy. I do a few at a time each day and now after a week, I’m not sure which is stiffness from the sling and which is from stretching. I can see a little progress from last week, I just want to have it all stretched out right now. Too impatient – where is the patience I have learned from RA? I find I can sleep on both sides at night, though the left side is a bit uncomfortable. It feels as if there is a heavy weight on it, the right side is fine. I still also sleep a bit reclines as well – it’s just so good to have other options at last. Things have been in a bit of an upheaval at the Future of Flight – Eddie submitted his resignation on Monday. He is going to be working with our financial advisor in Bellevue learning the basics of financial planning but won’t be selling. He will be running the office and doing meetings and events – I suspect there will be a lot of other things they will create as well. We have worked with Andy for several years, he has handled our investments and Roth IRAs doing a really good job. The focus of the Future of Flight has changed a lot – it is now more education than commercial aviation. It is the commercial aviation that drew Eddie there and he loved it. But the fun has gone out of it and the atmosphere is very difficult now, it is time to close the book on it. He is working with PNAA – they work with suppliers and manufacturers in aviation – they are a great group to be with and he enjoys working with all of them. It really feels like Fall now, crisp sunny days and sweater weather. I called my friend Melanie Hope in Las Vegas this afternoon – she sent me an email to see how I am doing. I so enjoyed talking with her, once again I realized how much I miss seeing her at Breakfast Club. We would laugh, joke, talk and everything in between – it is so satisfying to have someone who “gets” me. I will admit we didn’t do a lot of laughing during this conversation – we both have been through some very difficult times and it helps to tell her things I haven’t sad to anyone else. I know it will never go farther than the two of us. I felt so much better after our conversation – she is such an amazing, loving woman. I so glad we are such good friends, the kind who may talk for months and then pick up right where we left off from the last time. I hope she felt the same. Hmmm, this is going into another day. I had an email and photo from my sister Ellen; they have buttoned up the hatches and are prepared for Hurricane Joaquin coming up the East Coast. Ocean Grove seems to get off fairly lightly in storms, so I pray the worst that happens is they just lose their electricity. She wrote it is supposed to continue through Tuesday. The hurricane is going out to sea, but close enough to send a lot of rain and wind along the eastern seaboard. Now our Fall weather has become cloudy and foggy – less bright and cheerful than it was yesterday. The prediction is for rain – we’ve heard that before and nothing really came of it. It is just wait and see, dress for what it is at the moment and be prepared to bring a sweater of jacket “just in case”. Since I can’t think of anything else to write about – no one wants to hear any more about my arm and its progress. I saw my surgeon yesterday – end of week 8 – and he said I am healing well. I don’t have to wear the sling any more. I still have to be careful and of course I can’t drive yet. DRAT! Since I have to be able to drive myself for outpatient focused physical therapy, he gave me some simple exercises that will help me. I am supposed to see him in 3 or 4 weeks – another period of being housebound. The good news is I am less hindered now without having to wear the sling and I am healing. I want to speed it up, it is a slow process and this is where my patience has to really kick in. This morning was the first time I had a shower by myself in 8 weeks. Unfortunately my arm doesn’t quite stretch to my tush, so I had to ask Eddie to help me. I will be able to stretch in a bit as I use the exercises to get myself back to normal – whatever normal is for me. Who knows, I will be able to break out of this bubble I have been living in for weeks – I know the world is out there and it has continued on while I have been healing. I know it has stopped to wait for me, I wonder how it will feel to be independent again and be out on my own. It’s interesting that the one thing Eddie really noticed was my bruises from the accident. My right arm was nearly black all over as well as the right side of my back. He saw the full technicolor range as they began to heal. I couldn’t see the total picture, I saw the inside of my arm – that was plenty for me. Now I am back to my regular color again. I need a haircut in the worst way – I am 8 weeks overdue, it looks shaggy and doesn’t work well. I have a cowlick that sticks up no matter what I do. I look a bit like Alfalfa in the Our Gang comedy. I had found a great way to comb it over to the left, now it is too long for it to work well. It covers the cowlick well, when I have it combed to the right, it sticks up. I’m hoping maybe I can get to Michelle soon. I know she will be horrified by the trimming I did to keep it from being too shaggy. I have cut places to make sure I don’t have some bits sticking out – not the best job but it seems to have helped. Well, that’s from my perspective, not having been able to see the full effect. I am able to sleep on my right side for brief times – its more comfortable than my left side. I am so tired of sleeping reclined that I want to sleep in a different position. Still have to do the reclined but the side sleeping is getting better. Small improvements take more time to notice. That’s the update for now – slowly getting better and able to do more things. Sure beats going backwards!